Established in 2005 Pegazus are an experienced manufacturer of recreational motor yachts and fishing boats. 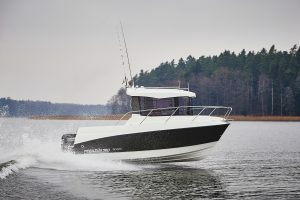 The award-winning range of models include the 600 Top Fisher, Escapade 600, Pegazus 550 and Pegazus 380. Pegazus are the only company in Europe that holds certificates for all of their products from 3m-6m in module B issued by Polish Ship Registry. This certificate ensures the highest quality and customer safety. Located in the beautiful region of Augustów, Poland customer are welcome to visit the modern shipyard and to test the boats on the beautiful lakes.